We had to recover the master database on oscar from a backup taken today on carolyn. Oscar is now back to being the master DB and carolyn is once again the replica DB. Things will be a bit slow as the database becomes resident in memory. Richard Lawn has given us a new SETI Perspectives article to think about. This one is about the Drake Equation. This time the primary database machine crashed and hasn't automatically recovered. We've fallen back to the replica machine, and the only symptom should be a few extra hours of outage. I'm glad we have the replica. Richard M Lawn has posted another interesting article to the SETI Perspectives forum. This one is about the mysteries of Fast Radio Burst (aka FRBs), possibly some of the most distant explosions ever seen. Hopefully there won't be any further problem. Our attempt to upgrade the memory on Oscar (the BOINC database machine) and Carolyn (the replica database) took a bit of DIMM swapping to find pairs of DIMMs that worked. Carolyn is still short two DIMMs (32 GB), but we didn't want to extend the outage any further to try to get it up to the full 192 GB. We might try to max out Carolyn during the outage next week. New forum, and a new contributor. We have added a new forum called SETI Perspectives that will showcase thoughts on SETI and related topics from people not directly connected with the Berkeley SETI group. Richard Lawn, Ph.D is our first contributor with an article about 'Oumuamua, the first object we've seen that convincingly originates from outside from outside the solar system. We hope have a long collaboration with Richard. Please welcome him into the SETI@home family. I'm sad to report that we've lost another long time SETI@home volunteer and moderator Gordon MacKenzie Lowe. A remembrance thread has been started here. Gordon will be greatly missed. The Berkeley Open Infrastructure for Network Computing (BOINC) system is the software infrastructure used by Einstein@Home and many other volunteer distributed computing projects. The BOINC Open Source Project is looking for volunteers to develop and maintain the BOINC client on macOS. The BOINC Client and Manager are C++ cross-platform code supporting Microsoft Windows, macOS, Linux, and several other operating systems. We currently have a number of volunteer developers supporting Windows and Linux, but our main macOS developer is winding down his involvement after many years. He is prepared to help a few new macOS developers get up to speed. If you want to help, please sign up to the BOINC Developer email list here: ​https://groups.google.com/a/ssl.berkeley.edu/forum/#!forum/boinc_dev. If you are not a macOS developer, but have other skills and are interested in contributing to BOINC, the link above also has more general information. GeorgeM, the machine that holds the data that you download, decided that it was time to verify that the RAID array is in good shape. That will slow down disk access until the verify procedure is complete. The main effect is slowing down the rate at which work can be created. It's likely that we'll run out of work in the next hour or so. Things should recover automatically when it's done. Because of the Christmas and New Years Day holidays, our weekly outage will be on Wednesday rather than the normal Tuesday both this week and next. Fall/Winter 2018 Funding Drive has started. We've started our 2018 funding drive. Many of you have probably received our email penned by one of our undergraduate researchers. If you can't wait, you can read yours here. Because we're not yet fully GDPR compliant, we're not sending emails to anyone with an EU/EAA email addresses, anyone who listed an EU/EAA country, or anyone who listed "International" as their country. And, of course, anyone who has opted out of our emails won't get them. The development of Nebula, the second and final stage of SETI@home data analysis, has made slow but steady progress. Check out the latest progress report: Improved multiplet-finding. Every year SETI.Germany organizes an event in honor of the 41th Anniversary of the Wow! signal. This year's event takes place from 15 to 29 August . Further information can be found here . Revised scale of significance of ET detection published. A group of SETI astronomers led by Duncan Forgan, and including myself and BSRC director Andrew Siemion, has published a revised version of the Rio Scale. The Rio Scale is designed to predict the public impact a signal would have, like the Richter scale does for earthquakes. The prior version of the Rio scale, in addition to being rarely used, tended to overestimate the impact of low quality or low significance reports of detection. Now all we have to do is convince other SETI astronomers and the press to use it. There is a related article at GeekWire. A calculator for Rio 2.0 scores in now available here. The HBO series VICE will be broadcasting an episode with a segment entitled "Are we alone?" starting June 1 at 11pm EST. It will be available on HBO streaming service, HBO GO, at 7:30pm EST. The segment includes interviews with the father of modern SETI, Frank Drake, and a SETI@home volunteer, John Fluth, who has been a part of the project nearly as long as I have. We'll be interested in seeing your reaction to this piece. Trailers are available through facebook and twitter. The UC data center switched over to a new firewall this morning. Since then packets into and out of the data center have been suffering drops. The Data Center staff is debugging the problem, we'll probably be dropping packets until it's resolved. The database has gotten hung up a couple of times with slow queries. I've restarted it once and that seems to have helped. It'll take several hours to be sure. If that didn't solve the problem, it probably means the index the server uses to choose workunits to send has gotten corrupted. If I need to rebuild it, we'll probably be down most of tomorrow while I do so. The outage ran long today because we needed to run down to the data center to swap some bad drives with new ones and reboot a few of the machine to pick up kernel and mysql updates. Now accepting donations of gridcoin. Because of several requests, I've resurrected the idea that we could take donation in gridcoin, a cryptocurrency you can earn by participating in volunteer computing projects. Our gridcoin address is now listed on our donation page. Thanks to our collaboration with Breakthrough Listen and their international colleagues, we will soon have the ability to access data recorded at the Parkes Radio Telescope in Australia. For the first time, this will give us full-sky coverage, including the southern hemisphere, in our search for ET. However, due to the enormous amount of data that the 13-beam receiver at Parkes can generate, we will require extra hardware to store and distribute it. We need your help to purchase this. Thanks to some special offers, one from the Hanson family in memory of Robert W. & Mary P. Hanson, one from Richard Haselgrove in memory of his mother, Jenifer Leech, and one from Mr. Kevvy, we have the possibility to match donations which will allow us to purchase the Parkes Data store server (~$34K) and the GPU development systems (~$10K) we will need for the coming year. For every dollar you donate in this special fund raiser, Mr. Kevvy will match it, the Hanson Family will match it with two, and Richard Haselgrove will match it with two more. That means for every dollar you donate we'll get six dollars towards the purchase of these servers! Because this is a special fundraiser we'll have special notation on your account page and on the forums. The 12TB disk drives in the Parkes Data Store cost $450. One sixth of that is $75. So, a donation of $75 or more gets you a disk drive icon. The GPUs in the GPU development machine that we will be using for our recording systems at future telescopes are $1500 each, so a donation of $250 or more will get you a GPU icon. And as always, any donation of $10 or more will get you a green star. But in the end, it's not about the icons: it's about getting the data and making a discovery for the ages. Your help, whether by crunching data or by donating, is always appreciated. I had to turn the splitters off, again. I underestimated the rate at which we were creating work (damn moveable decimal points!). I thought we could go without adding more space to the database until we had time (tomorrow morning) to delete the old database spaces. I was wrong, we really zoomed through the files on disk, and we ran out of space. Deleting database spaces is dangerous, so I really want Jeff to check the command script before it gets run. That won't happen until morning. But once it does we'll be back in operation. Hopefully most SETIzens won't even notice this short absence of work. research institutions. We’re also psyched that we get to wake up each day and hunt for aliens. Richard Lubrich has passed away. Long time setizen, Richard Lubrich (Dr. C.E.T.I., aka Dr. SETI, aka nobody) passed away today. Richard was a fixture on the forums from our earliest days. He was a great friend to SETI@home and will be greatly missed. SETI@home 2017 fundraising drive has begun. We've started our annual fundraising drive to help raise the money we need to keep SETI@home running and expand it to new telescopes. Your computers provide us with the power to analyze this data, but your donations are an important part of keeping us operating. If you haven't yet received your fundraising letter, you can preview it here. You can donate at https://setiathome.berkeley.edu/sah_donate.php. Thanks for keeping SETI@home going! Berkeley SETI Research Center is holding a fundraiser to raise $7000 to send our student interns to conferences to present their work. We’ve been working with some great students at Berkeley SETI, and we’re optimistic that some of them will become the scientists and engineers who lead the field in future and maybe even find the signal we’re searching for. In the meantime they have been doing amazing work and we’d like to send them to academic conferences to present their results, and for their own professional development. If you would like to help with this effort, we are running a crowdfunding campaign at https://crowdfund.berkeley.edu/SETItravel - every donation counts! We also have some fun perks including the chance to ask questions to members of the Berkeley SETI team, and to attend a party in our lab. Although this does not directly benefit SETI@home (our annual fundraiser will start in a couple weeks), it's a worthy cause. I'll be contributing! I've been asked by several people to post a status update on the situation at Arecibo following hurricane Maria's passage. Unfortunately, at this point we haven't gotten any news. The last information we have is from a couple hours prior to when the eye passed Arecibo. That report said all the employees were accounted for and in sheltered buildings. Since then we've had no news. That's understandable. With power out on the whole island, electronics communications aren't going to be possible for some time. Heavy rains are still expected today, so I'm sure that the primary concern is still keeping everyone safe. Assessment of any damage will take time. Let's hope that everyone is safe, that their homes are intact, and that any damage can be repaired quickly. Data from "Tabby's Star" is flowing. For those who didn't recognize the name KIC8462852 in their work unit names, this data comes from GBT observations of Tabby's Star (aka Boyajian's Star, aka WTF-0001, aka the Weirdest star in the galaxy). This is not yet the full data set, which lives at Penn State, it's some test on-target/off-target observations that we're checking out. You might also notice another change. We've doubled the size of our work units which will reduce our quantization noise by 34%, and, depending on the strength of other noise sources, could give us as much as double that as a sensitivity increase. SETI.Germany is again organizing this Year's event in honor of the 40th Anniversary of the Wow! Signal. Further information can be found here. The event will run from Aug 15th, 4.00 UTC to Aug 29th 2017, 4.00 UTC. Ryan Lynch works on pulsar research at the Green Bank Observatory. In this video, we sat down with Ryan to chat about how to paint the world's largest steerable radio telescope, and what modern convenience he misses most while living in the middle of the National Radio Quiet Zone. A 3D tour of the Green Bank Telescope. We took a GoPro Omni 360 VR camera up to the top of the Green Bank Telescope, the largest steerable radio telescope in the world. Join us on Part 1 of our journey, as we check out the telescope wheels that each carry more than a million pounds of weight, and learn about the 2004 individually controllable panels that make up the surface of the dish, which is larger than a football stadium. The SETI@home back end is getting closer to completion. * Our algorithms for removing RFI and finding repeated signals work fairly well. * We can inject "birdies" (synthetic signals) to measure how well they're working. * We've developed tools for browsing, drilling down, and visualizing signals and candidates. At this point we need to manually scan lots of results, looking for cases where our algorithms don't seem to be working perfectly. If you like, you can help us with this. Although this partnership doesn't involve data from telescopes at Jodrell flowing to SETI@home (at least at the present time), the sharing of data, algorithms, and strategies will benefit the science programs at Berkeley and Jodrell, as well as at other telescopes involved in Breakthrough Listen and in SETI in general. You can seen an interview with Mike, recorded a few weeks back, at https://youtu.be/ZRMiuCFACCw, and take a 3D tour of the Lovell telescope and control room at Jodrell at https://my.matterport.com/show/?m=B8UZb1joxsG. Engadget has published an article on SETI which includes discussion of Breakthrough Listen and SETI@home. New SETI@home web article in "The Atlantic"
The Atlantic has published a new article entitled A Brief History of SETI@home featuring interviews of Dan Werthimer, David Anderson, and Eric Korpela. Berkeley SETI's Steve Croft is joining other SETI and exoplanet researchers on Deep Astronomy right now (4 pm PDT, 2300 UTC). If you join live you can ask questions of these scientists. Once again I need to explain our policies on free speech, as I've been getting lots of nastygrams both here and on twitter and facebook. First, let me explain our relationship to the UC Berkeley administration. Despite the fact that I met with the Chancellor once for about 15 seconds, the UC administration neither knows nor cares that SETI@home exists. Threats of quitting SETI@home or withholding donations will be about as effective as kicking a stray dog because you don't like something the dog catcher did. They won't notice. They don't care. They get no direct benefit from SETI@home, so here will be no effect on them, or the on University. We could shut off our servers tomorrow, and nobody in Sproul Hall would notice a thing. So here are our project commandments on free speech. 0. Thine speech is free as in freedom, not free as in beer. 1. Thou mayst speak thine mind. 2. Thou shalt do so in the appropriate forum. 3. Thou shalt recognize that speech has consequences to thine self and to others, some legal, some financial, some painful. 4. Thou shalt not force others to pay for the delivery of or the consequences of speech they may not agree with. 5. On public SETI@home forums, thou shalt use language a parent would not mind their 12 year old hearing. 6. Failure to obey the forum rules will result in moderator action. If thou dost not understand, see thou commandment 4. In other words, if you want to be heard on the current controversy, try the Politics forum. Then use twitter, facebook, instagram and whatever social media you want. SETI@home in general and me in particular have no power to effect change of any sort. It sounds like there's still going to be a riot in Berkeley tomorrow because a group of white supremacists and a group of left wing anarchists are ignoring commandments 2, 3, and 4. The people of Berkeley and the people of California will be picking up the tab for their "freedom of speech" whether they want to or not. And personally, I think that's what's been missing from the whole discussion. And with some incredible luck we didn't lose any entries in the pulse signal table at all. We've found some corruption in a part of our science database that holds the power vs time profiles of detected pulses. We're running some table checks to see if we can localize the problem and come up with a solution that minimizes the lost workunits that need to be redone. We're moving closer to completing the analysis of our 18 years of Arecibo data. Recent work has given us a good handle on RFI removal. See the Nebula blog for details. We're having some problems with centurion, the computer holds the Breakthrough Listen data and does our Breakthrough Listen splitting. Correction will probably require an OS upgrade. Because of this GBT data will be scarce over the weekend. A new blog documents the progress and status of Nebula, the SETI@home back end. We changed the SETI@home web site to use Twitter Bootstrap, a CSS toolkit. This makes the site usable on small displays, and lets us use color schemes developed by other people (this one is called Darkly). The SETI@home Fall 2016 fundraiser has begun. If you haven't received your fundraising letter you can find it here. The abundance of data has made our funding needs a little more demanding this year, so we're hoping you can help us out a bit more. We are sad to report the passing to long time SETI contributor Celttooth (M. Ian Russell) We will be lessened by his absence. Read about Nebula, a new and faster back end for SETI@home. Nebula removes RFI and finds persistent signals. Its goal is to let us finish the current SETI@home experiment. Are aliens talking to us? Dr. Korpela has posted his thoughts about the claimed detection of pulsed emission from extraterrestrial intelligence being beam at Earth from 234 different stars. He's not optimistic. The Breakthrough Listen project has also posted a statement of a similarly cautious tone. The replica database will be offline until we can restore it from the primary database on tuesday (at the earlies). This will result in slowness of the web site and the scheduler. The Breakthrough Listen team has posted their archival search for emission from HD 164595 and the initial analysis of their recent observations of that target. "Baffling" "signal" "from HD 164595" is probably none of the above. I was one of the many people who received the the email with the subject "Candidate SETI SIGNAL DETECTED by Russians from star HD 164595 by virtue of RATAN-600 radio telescope." Since the email did come from known SETI researchers, I looked over the presentation. I was unimpressed. In one out of 39 scans that passed over star showed a signal at about 4.5 times the mean noise power with a profile somewhat like the beam profile. Of course SETI@home has seen millions of potential signals with similar characteristics, but it takes more than that to make a good candidate. Multiple detections are a minimum criterion. Because the receivers used were making broad band measurements, there's really nothing about this "signal" that would distinguish it from a natural radio transient (stellar flare, active galactic nucleus, microlensing of a background source, etc.) There's also nothing that could distinguish it from a satellite passing through the telescope field of view. All in all, it's relatively uninteresting from a SETI standpoint. But, of course, it's been announced to the media. Reporters won't have the background to know it's not interesting. Because the media has it, and since this business runs on media, everyone will look at it. ATA is looking at it. I assume Breakthrough will look at it. Someone will look at it with Arecibo, and we'll be along for the ride. And I'll check the SETI@home database around that position. And we'll all find nothing. It's not our first time at this rodeo, so we know how it works. Setizen Jack Lass has passed away. The SETI@home team is sad to note the passing of long time SETI@home volunteer Jack Lass. Many of you will remember him from the original SETI@home forums. Our condolences go out to his wife and son. We will miss him. To celebrate the 39th anniversary of the Wow! signal, SETI.Germany is organizing a SETI@home crunching competition from Aug 15th to Aug 29th. Everyone is welcome! Vice Magazine has posted an article about the potential closure of the Arecibo observatory. We are sad to hear that our friend and colleague Stéphane Dumas passed away this week. Here is a video of his recent SETItalks talk. Arecibo still threatened with closure. Recently the NSF announced its intent to start the process which could lead to the partial shutdown, mothballing, or complete disassebly of the Arecibo Observatory. As most of you know, this is not a new discussion in the scientific community. Several years ago we had asked you write letters to Congress in hopes of averting this fate. A petition has been started on whitehouse.gov to ask the President to ensure it is funded. I'm pessimistic about the chances that it will change anything, as the President cannot change Congressional budget priorities, and only has limited ability to move money between NSF programs. However, bringing attention to the issues of science funding in this country cannot hurt. We couldn't do any of this without you. Our search relies on the generosity of those who donate their computing resources and electricity, their coding skills, and also financial help to make what we do possible. Any and every contribution counts, and we appreciate all of you. While we are not funded by big government grants, we are fortunate to be based at one of the world's leading public universities, where one of our most precious resources is the bright young minds who will be the scientists and engineers leading the search in the years to come. So we invite you, if you feel motivated to do so, to help us with the resources to set up an undergraduate lab with new software-defined radio tools to help train our undergrads in the tools of the trade. To get an idea of how engaged these students are, check out our interview with Kyle at https://youtu.be/PIJ6TkM46wE. And if you'd like to support our work, please visit https://crowdfund.berkeley.edu/project/1704. But whether or not you choose to contribute financially, we are so grateful for all of you that have chosen to be a part of SETI@home as we attempt together to answer humanity's biggest question. Thanks! Article about distribution of Breakthrough data. Inverse.com has published an article about our distribution of Breakthrough Listen data. Breakthrough Listen data now flowing. Happy Yuri's Night #55, the 55th anniversary of Yuri Gagarin's historic first space flight on April 12, 1961. In celebration, we're starting distribution of Breakthrough Listen data from the Green Bank Telescope today. No intervention is necessary on your part. The main difference you will see is a change in your screen saver graphics, if you have them running. We'll still be distributing Arecibo data as well, so that won't change. The Breakthrough Initiative is also distributing raw data in multiple formats, so you can write your own analysis code if you'd like. You can read about it in this press release. SETI@home 8 released for Raspberry Pi. It should also work on other ARM linux machines that use the gnueabihf ABI. We're raising money to support our undergrads to build hardware to search for ET. We'd love for you to help at https://crowdfund.berkeley.edu/project/1704. Perks at the higher levels include a roundtable with BSRC Director Dr. Andrew Siemion, tours of our UC Berkeley labs, and a behind-the-scenes tour of the Green Bank Telescope. Or you can just bask in the warm fuzzy glow of helping out our undergrads. Every donation counts! Main web server crash / migration. Our main web server machine became inoperative this morning. We have migrated web service to another machine. For those of you unable to attend in person, SETI Institute talks are typically recorded and posted on YouTube about a week after the event. Berkeley SETI Research Center's Dr. Steve Croft, in collaboration with colleagues at UC Museum of Paleontology and the Space Sciences Laboratory's "Multiverse" education group have put together an educational site focusing on the conditions needed for life to arise in the Universe. Although aimed primarily at high school teachers and their students, this material may be of interest to broader audiences. In the "Research Profiles" section of the site you can also find an interview with BSRC's Dr. Eric Korpela, Director of SETI@home. Kevin Luong joined Berkeley SETI Research Center as an intern in summer 2015. Kevin worked with David Anderson to revise the NTPCKR system to run on cloud computing servers. There are still a few kinks to sort out, but if it works, this should let us run our data base through NTPCKR in a few weeks instead of more than a year. Kevin transferred to UCLA in the fall, but is continuing to work with SETI to explore cloud computing for other projects. We'll be launching an expanded undergraduate internship program soon. Details will be announced later this year. I know everyone has been waiting. It's finally time. We need some Mac users with ATI Radeon HD4000 series card to help the beta test before we can release that version. So if you've got an HD4XXX GPU, please join the beta. SETI@home Version 8 has been released. SETI@home version 8 has been released. This version finally gives us the ability to process data from multiple sources, including the Green Bank Telescope. That means we'll be ready for data from Breakthrough Listen when it's available. We're releasing the versions for CPUs first. We'll release versions for graphics processing units (GPUs) and Android devices as they come available. We're releasing slowly so as not to overtax our download server. This update will happen automatically, unless you use a special version you got from another web site. We've also made small changed to our science code to improve the Gaussian fitting routines. This means version 8 results are not compatible with version 7. So if you use a version of SETI@home you got from another site, or if you compile your own version, you'll need to get or build a version 8 application. I'm sure link will be made available in the Number Crunching forum. A shout out to the volunteer developers (especially Urs, Jason and Raistmer) and all the beta testers for helping out. The University of California's big 24 hour fundraising extravaganza started Wednesday, November 18th at 9 pm and ends on Thursday, November 19th at 9 pm. If you'd like to make a donation to help SETI@home access our new data sources you can do so here. Did SETI@home ever find aliens? While still working our way through a lot of data, this article asks the question: Did SETI@home ever find aliens? BSRC Director Andrew Siemion was called to testify to the US Congress about the search for life beyond Earth. Video at http://t.co/1spztN81Pe (Andrew's testimony starts at 28:49). Eric Korpela discusses alien contact. SETI@home Director Eric Korpela discusses alien contact in the MeanwhileInTheFuture podcast episode entitled "Greetings". The entire data center (where our servers are) had to be shut down. That crisis is now over and we're carefully bringing our servers back up. See details here. The White House wants to hear about your experiences with citizen science. You can share your stories here here. SETI@home Director Eric Korpela's most recent SETI paper "Modeling Indications of Technology in Planetary Transit Light Curves - Dark-side Illumination" (in collaboration with Prof. Shauna Sallmen) has been published by the Astrophysical Journal. A preprint is available at arXiv. To celebrate the 38th anniversary of the Wow! signal, SETI.Germany is organizing a SETI@home crunching competition from Aug 15th to Aug 29th. Everyone is welcome! The science database is down while we make a copy for offline data analysis. This is taking a bit longer than anticipated. During this period work production is off. We hope to resume work production tomorrow morning. David Anderson, co-creator of SETI@home and Director of BOINC, took some time to chat with us recently. Developer Matt Lebofsky is key to keeping SETI@home software & databases running. Check out our latest video profile of one of the guys who sends you your work units. We put out a call on Twitter and Facebook for questions for our scientists and engineers. We picked seven of the submissions and had our team give short answers. Check out SETI@Andalucía, a new Spanish-language web site about SETI and SETI@home. On Sunday, May 17th campus is upgrading the network infrastructure at the facility hosting our servers. We will bringing the projects down for about 6-8 hours (starting at 8am, Pacific Time) to avoid complications during the upgrade. Shelley Wright: Is ET using infrared lasers to communicate? Here's a research poster by BSRC director Andrew Siemion from 2013 (but still mostly up to date) summarizing our group's work, including SETI@home. We are currently working on deep cleaning one of our databases (see http://setiathome.berkeley.edu/forum_thread.php?id=77096), but we hope to have new work units out to your clients soon. Thanks for crunching! Due to recent problems we are doing a deep cleaning of one of our larger databases. Update: though we are still working on the database, we were able to start workunit generation again over the weekend. Over the weekend a false news report from a known source of false news reports reported that we had detected an extraterrestrial signal. Of course, if we had, known sources of real news reports would also be carrying the story. In other words, no such luck. We'd like to keep you up to date with what's going on at Berkeley SETI Research Center! Like us on Facebook at http://www.facebook.com/BerkeleySETI and follow us on Twitter at http://twitter.com/setiathome where you can find video interviews with Berkeley SETI Research Center staff, news items about our research, and more. We'll be linking to some of these posts via SETI@home client messages too. Our message board at http://setiathome.berkeley.edu/forum_forum.php?id=908 will continue to post updates from the team including news items, server and database status updates, and other relevant topics, and you can participate in other forums at http://setiathome.berkeley.edu/forum_index.php too. The databases are still being repaired, but we are now in a state where we can create new workunits and collect results. Dr. Korpela has posted slightly more detail of his thoughts on sending messages to ET. The versions of SETI@home currently distributed can't run on Android 5+ (Lollypop). We're working on new versions. We've limited distribution to earlier distributions. If you can't get work on Android 4, it may be necessary to update your BOINC app. In conjunction with other interested members of the SETI community, we've written a statement on beaming messages to other planets. The essence of the conclusion is that a few people shouldn't be making this decision for an entire planet. Prof. Charles Townes has passed away. We were saddened to learn that colleague Professor Charles Townes died this morning, January 27th, at the age of 99. A professor at UC Berkeley since 1967, Townes had a long and distinguished career, winning the Nobel Prize in Physics in 1964 for work that led to the development of the laser. He was active in research as recently as last year, making regular visits to his office at UC Berkeley's Space Sciences Laboratory, and to Mount Wilson Observatory where he worked to develop the Infrared Spatial Interferometer telescope. His broad research interests included the search for extraterrestrial intelligence - as co-author of a 1961 paper, he was one of the first to discuss interstellar communication using lasers. This gave rise to the rapidly growing field of optical SETI, including searches currently underway at UC Berkeley. Prof. Townes also served as an Advisory Board Member to the new Foundation for Investing in Research on SETI Science and Technology. We will miss him here at UC Berkeley, and send our condolences to his wife Frances and family. It appears that the root partition filled on marvin (rapidly) while I was AFK, for no reason that I am aware of, which caused it to crash. Nobody is at the colocation facility right now, so the astropulse DB is down. I'll try to get remote accesses for a reboot, but chances are that marvin is down until monday morning. Own a piece of SETI history. Astropulse database fix is complete. Validators and assimilators and splitters are back on. New Astropulse work should be flowing soon. The four disks from AO have arrived - about 5TB of data. I have queued them up for pre-processing (radar blanking) so new SETI@Home workunits should be going out soon. We've now inserted 231,770,000 of the 306,362,193 AstroPulse signals into the database. Over the last week the insert rate has slowly declined from 1.5 million per hour to 870,000 per hour. At that rate we're looking at another 86 hours (+24 for index building), which means Saturday morning (US Pacific time). On the plus side, Arecibo has four full drives of data that they can send us, so there might be SETI@home work before then if we're really lucky. I'll be posting updates in the Tech News forum through out the week. If you haven't been checking the tech news, here's the current status. We're rebuilding the Astropulse database. The current rate is an anemic 1.5 million rows per hour. There are 220 million rows left to do, which translates to 140 hours. Then I estimate it will take 24 hours to build the one remaining index necessary to create new work. That adds up to a week. I don't really understand why this is so slow. The disk array should easily handle twice that rate. We are likely to (temporarily) run out of workunits to process as soon as this weekend. Please read this recent news item from Eric Korpela for further explanation leading up to this. We are currently solving various database issues, developing a new splitter so we can start processing our Green Bank Telescope data, and hunting for tapes that haven't fully been processed to get out of the current drought. The 3rd annual SETI.Germany Wow!-event has completed, with 838 participants from 48 countries generating a record 463 million credits. See a list of the winners. Our colleagues here at the UCB Space Sciences Lab recently reported the first capture and analysis of interstellar dust particles. They were aided by thousands of volunteers in the Stardust@home project. 37 years after the detection of the Wow! Signal on August 15th, 1977, SETI.Germany is holding the third SETI@Home-Wow!-Event from 15.08.2014 to 29.08.2014. Join the crunching race, and maybe find the next Wow! signal. Everyone is welcome. Register here. What does loss of net neutrality mean for volunteer computing? Dr. Korpela has posted a new blog entry on Net Neutrality and why its loss might be bad for distributed computing. It includes instructions on how to comment to the the FCC about the issue. Recently Dan Werthimer was at the Smithsonian giving a talk about SETI. Video of this presentation is now available online. Our own Dan Werthimer went before the U.S. House of Representatives to present the current status of SETI research. Here is the full text of his testimony. Video is available at this location. A new short video about our project (made by the Exploratorium in San Francisco) is now available. You can view it at the Exploratorium website or on YouTube. Friday March 21 SETI talks to be webcast live. To connect go to http://connect.arc.nasa.gov/ebi2014/. If you have difficulty with that link, try http://connect.arc.nasa.gov/ebi2014?launcher=false Once you are there, select enter as guest, and enter a name, then click "Enter Room". Participants may get the opportunity to ask questions of the speakers. Astropulse work is flowing once again. Thanks to Matt and Jeff for performing the necessary brain transplant. The server hosting the Astropulse database crashed. The database is okay, and we have a replacement machine, but it may be 1-2 weeks before Astropulse is back on line. We are still serving regular (multibeam) workunits in the meantime. We've released SETI@home 7.03 for Intel GPUs that support OpenCL 1.2. If you have an Intel GPU and want to use it to speed up SETI@home make sure that "Use Intel GPU" is set to "yes" in your Project Preferences. Thanks again to the crew at lunatics.kwsn.net for porting and testing this app. Our Winter 2013 fundraising drive is underway. If you didn't get our email detailing some of our accomplishments and plans, you can read it here. Long-time setizen John Clark has passed away. We're sad to report the passing of long time SETI@home volunteer John Clark. Those of us who frequented the forums will certainly remember him. John was very recently mourning the passing of his wife, Sheila. Our thoughts are with his family and friends. People are posting their condolences and their memories of John in this thread. We've received notice that the NRAO telescopes at Greenbank will be shut down at 5pm on Friday if the government shutdown continues. We don't have any immediately scheduled observations there, so this should not affect us in the short term. We have not yet heard of any impact on Arecibo, but since it is operated under contract rather than being directly operated by the government, we are hoping observations there will continue. We are now mostly recovered from a campus wide power outage. Last night there was a power outage that affected the entire Berkeley campus. The data center, where our servers are located, does have facility wide UPS so all servers stayed up. Unfortunately, the data center air conditioning did not stay up. Machines were getting hot, so the data center staff had to bring them down. We're beta testing the Android version of the SETI@home application and we're looking for more testers to speed up the process. If you'd like to help, install the Android version of BOINC through the Google Play Store or the Amazon App Store. Then when asked to join a project enter http://setiweb.ssl.berkeley.edu/beta as the project URL. note: The beta project does not have access to SETI@home user accounts. Unless you're already using the beta project, you'll need to create a new account there. SETI.Germany is organizing an Event to celebrate and honor the 36th Anniversary of the Wow! Signal detection. The event will happen from Aug 15th, 16:00 UTC to Aug 29th 2013 16:00 UTC. Dr. Korpela has posted his promised summary of what is new in SETI@home v7. The AVG virus scanner heuristic virus detection method reports a false positive for SETI@home version 7.00 on windows. This alert doesn't not indicate an infection with a known virus, but indicates that the application contains code that the virus scanner considers to be suspicious. AVG 2012 apparently does not report any issues. We believe that this alert is related to the method we used to compress the executable in order to save network bandwidth. We are examining how we can resolve the problem. Until then the best strategy is to click "cancel" or "ignore" to the AVG warnings. Your BOINC client should automatically download it in the next few days. No need to abort any current work you are doing. We've released versions for Windows, MacOS and Linux, and four versions for NVIDIA graphics cards running under windows, and versions for ATI graphics card running under Windows and Linux. My thanks to the KWSN/lunatics folks for getting this done and especially to Raistmer, Jason, Josef, Urs, Claggy, Mike, Richard, and too many beta testers to name. Tomorrow I'll post explaining why we wanted version 7 and what's different about the analysis it does. The entire lab was shut down this past weekend for electrical repairs. We came back on line Sunday morning (Feb 24th). Problems with timeouts will continue to occur, but less frequently, we hope. SETI@home scheduler is down until further notice. Scheduler crashes have continued, so we'll be down until we've isolated and solved the problem. We're thankful for you, our volunteers, who continue to donate your time, computers and money to keep SETI@home up and running and improving. The scheduler will be down until someone can get to the lab to reboot it. I'll try to convince Angela to let me go in once the turkey is in the oven. We're continuing to have issues due to a database problem early last week and a botched attempt to fix it. The problem is that the result and host tables in the database have grown large enough, and hosts have gotten fast enough that the lookup of result in process for a host and the enumeration of new results to send don't finish before the web connection times out either on the server or the client side. This resulted in hosts being assigned large number or results to compute without the transaction that tells them about these results being completed. The host. think it received no results would then contact the server for more results, which it would again not receive. This isn't a hardware problem. The database currently fits in memory and the processors are fast. We've just crossed a threshold where each host computes fast enough that host queues and the result table have become large enough to cause this problem. To solve it, we've put per host limits on results in process back in place. But hosts that are having this problem will probably continue to have it until the average number of results per host has fallen to a workable level. That could take weeks. For a more permanent fix, we plan do more work in each result by quadrupling the size of the workunits. But that fix will probably take months to implement and test. We've started out annual fund raising campaign. If you haven't gotten an announcement in your email, you can find your letter here. Thanks in advance for your help keeping SETI@home going! SETI@home volunteer Mr. Kevvy has started a Weekend Fundraising Challenge to raise money for disks we need to transport data from Green Bank Observatory. We've teamed up with OpticsPlanet to create a fundraiser where you can support SETI@home while getting great deals on telescopes, astronomy gear, sunglasses & prescription eyewear and much more! Check it out here at the SETI@home coupon store. Thank You Terabit Systems and GPU Users Group! Through the fine work of the GPU Users Group, Terabit Systems has generously donated both a 1Gbit and a 10Gbit ethernet switch to our group. The 1Gbit switch will be a substantial upgrade to our server room. The 10Gbit switch will become part of a very high speed SETI spectrometer to be deployed at the Greenbank Telescope. Bug in server affecting older BOINC clients with NVIDIA GPUs. We've identified a bug in the current BOINC server that is online at SETI@home. With older BOINC clients this bug results in running multiple SETI@home GPU applications simultaneously on a single GPU. While we debug and fix the problem we've suspended distribution of NVIDIA work. We hope that everything will be back to normal some time tomorrow. We're slowly recovering from the power outage. The main BOINC database was performing poorly at first for an unknown reason. We'll be monitoring it as the recovery continues. New AstroPulse applications for GPUs. We've released the first of four new AstroPulse Windows applications for ATI/AMD Graphics Processing Units that support the OpenCL language. If you've got an one of these GPUs you may be able to process AstroPulse results 15x faster than your CPU alone. If your computer supports a version, it should get it automatically. The first release supports ATI GPUs on BOINC 7.0.25 or later. The second release (probably next tuesday) will support ATI GPUs on BOINC versions prior to 7.0.25. The final two version will be for NVIDIA GPUs. (Until then NVIDIA GPUs will have to satisfy themselves with SETI@home results). Thanks to the optimizers at KWSN and the folk at the beta project for helping me get this out. SETI.Germany is organizing an Event to celebrate and honor the 35th Anniversary of the Wow! Signal detection. The event will happen from Aug 15th, 4:00 PM to Aug 29th 2012 4:00 PM UTC. Berkeley SETI PhD candidate Andrew Siemion talks about why your computer won't be getting an alien virus in this article on io9.com. Our entire building suffered some wild power fluctuations early this morning, affecting many projects including SETI@home. This is completely unrelated to power issues from a couple weeks ago. Despite losing some hardware all of our services are recovering. There was a major power outage on Tuesday evening that affected several buildings here on campus including the entire Space Sciences Laboratory. Power has been restored this morning, and we are slowly getting the project back on line. Your chance to be internationally famous. The author I mentioned in the previous news item would also like to interview someone outside of the US, hopefully in an interesting location. Again, contact me if you fit the bill. Your chance to be famous. We've been contacted by one of the authors of a book/multimedia project called "The Human Face of Big Data." They're looking to interview someone who is heavily involved in SETI@home (lots of computers) and is also participating in SETILive. If that's you, drop me a line and I'll help you get connected. If you're wondering about the difference between SETI@home and SETILive, Dr. Korpela has posted the differences here. Astropulse v6 has been released for linux and windows. We've released the Astropulse version 6 application to the SETI@home project. The only real difference is a couple of minus signs in the code that were added to match changes to the way the data recorder works. It'll take a while for the credit granted by this application to settle out to a reasonably constant value. If you run optimized applications, I'd suggest you wait a couple of weeks before starting to do Astropulse v6 work just to avoid the possibility that you will be granted an extremely low credit for your work. Update: After reaching a logical (i.e. not physical) limitation in our science database we had to rebuild one table. No data were lost. We resumed normal operations today around noon. SETI@home Project Scientist Eric Korpela has published a blog entry in the Huffington Post's new science section. Other Berkeley SETI bloggers may follow. Depending upon the response we may only blog there, may restrict blog entries here to things directly related to SETI@home, or we may duplicate the posts here. Let us know what you think. Check out our First Look at Kepler SETI Candidate Signals - No ET yet. Tuesday morning we reached 2 Billion BOINC results processed by SETI@home! Or to be more accurate, 2 to the power of 31 results (2,147,483,648). This explains why we haven't yet recovered from the weekly outage: we need to update code to accept larger numbers. BOINC download server is down. The BOINC download server is offline, and will remain so for a day or two while we effect repairs. For the last few months, network routing issues have been interfering with the connectivity of some participants. The actual problem turned out to be a lack of sufficient memory in our router at the PAIX in Palo Alto. Two days ago we increased the memory in that router by a factor of four. This fixed the problem. We would like to thank Hurricane Electric, Packet Clearing House, and CENIC for their great technical help in diagnosing and fixing this problem. Our annual fall funding drive has started. If you haven't gotten our message in your email, you can see it here. Please help us keep SETI@home going by donating today. In addition to crunching, you can provide some support to SETI@home by using GoodSearch and GoodShop. These search engines redirect a half their advertising to revenues to charity. Just be sure to choose "University of California - SETI@home" as your charity of choice. We have migrated storage service to thumper. Now it's a matter of transferring raw data to thumper, preprocessing it, and splitting it. This will all take some time. The Overland server is up and its raid is operational (thanks Overland!). Diagnosis of this unit is proceeding. One of the RAID arrays failed to rebuild. Personnel from Overland Storage are working to solve the problems. Meanwhile we're creating temporary working storage on Thumper. Change of management at Arecibo. ML1 pointed out an article about the change of management of the Arecibo Observatory. Cornell University, which has managed Arecibo since it opened, will no longer be managing the Observatory. A consortium of organizations will new be handling the management. We don't expect this to affect SETI@home much. It may mean changes to how observing is scheduled and how much observing time we receive per year. Green Bank Telescope observations to start Saturday. Grad student Andrew Siemion reports that new modifications to a data recorder at Green Bank that we need for our Kepler SETI observations are now complete, thanks to a huge amount of help from Paul Demorest, a former grad student and one of initial authors of AstroPulse. Our first hour of test time is scheduled for this Saturday, 17:30 EDT. We'll be observing with 450 seconds per target on 90 Kepler field stars with interesting planet candidates (~habitable zone, ~Earth size, ~Earth period, ~several planets), then do a raster scan of the entire Kepler field. We are sad to report that long time SETI@home volunteer Wes Wycoff has passed away. His efforts will be missed. Our condolences go out to his friends and family. As noted in the Scientific American and elsewhere, the Allen Telescope Array was recently forced into hibernation. While we are sad to see this happen, SETI@home receives its data elsewhere, so our project is not directly affected. Dr. Eric Korpela wrote a helpful Q&A about this in the SETI@home Staff Blog. SETI@home volunteers that use Flattr can now make microdonations to SETI@home by pressing the button at the bottom of the main SETI@home page. Over this past weekend we had an disk issue (unrelated to the new servers) which hampered workunit creation. We back to full production at this point, though due to high demand it might be a while until your clients receive new work. We've been offline for over a month to remodel our database servers. The bulk of this work is complete, and work is being distributed. Please note we may continue to bring servers up/down over the next few weeks (outside of regularly planned outages) as we wrap up the final stages of this major endeavor. Dr. Masaki Morimoto, Japanese SETI pioneer, has died. Dr. Masaki Morimoto, a SETI pioneer and one of the fathers of Japanese radio astronomy, passed away this morning at the age of 78. He suggested the frequency L11->L10 transition of formaldehyde (4.83GHz) as a possible magic frequency for extraterrestrial communications. He was active participant in SETI searches up to the present, and influenced many younger researchers. He will be missed. The project is down while we remodel our database servers. The machine that was running the main BOINC database has become too unreliable to use. The backup server does not have the capacity to run the project on its own. The very good news is that we just ordered two new servers! One will be the new BOINC database server and the other will be the new back end science database server. Our capacity to both distribute and analyze our data will increase significantly with these new machines. While we prepare for these new servers and get them going once they arrive, the project will be down. Although no new work will be distributed, all outstanding work will be uploaded and credited. This web site and the forums will remain up for most of the remodeling period. Funding for the new servers has come entirely from very generous donations from the SETI@Home community. Don Backer has passed away. Don Backer, Berkeley professor and director of the Allen Telescope Array, passed away on Sunday, July 25th. Don was a very important contributor to radio astronomy and to the study of pulsars. He will be missed. A structural failure at the telescope on February 3rd was partially repaired in March, and we've been observing with reduced motion since then. The next phase of repairs is slated to start July 12th, and may take up to 6 weeks for full implementation and testing. Astropulse: A Search for Microsecond Transient Radio Signals by Joshua von Korff (congratulations, Josh!). Here is the pdf of another paper presented at the Astrobiology Science Conference. This paper describes the various strategies and instruments developed by Berkeley SETI / CASPER team, with a focus on hardware. Here is the pdf of a new paper describing our strategy for rejecting interference and finding candidate signals. This paper was presented at the Astrobiology Science Conference which was held April 26-29 in Texas. David Anderson, director of BOINC and SETI@home, is interviewed on www.seti.cl (Spanish, English). You can now see video from "The Great Debate - Are we Alone? ", publicly held by Dan Werthimer and Geoff Marcy on April 30th at UC Berkeley. The IRC channel #boinc-it on irc.freenode.net has been created for discussion of BOINC and SETI@home in Italian. Check out a Youtube video about making a multi-GPU desktop supercomputer. Designer of the Arecibo telescope has passed away. William E. Gordon, the designer of the Arecibo radio telescope, has passed away at the age of 92. We started sending out our annual year-end donation drive mass e-mail. The process could take days. If you didn't get one (possibly due to spam blocking), you can read the same letter on-line here. Thank you!!! we resolve this, the project is unable to send out work or receive results. We have been in the process of transitioning parts of our data pipeline. You may be having trouble downloading workunits until this process is complete - hopefully later this week. Galactic Watercooler Podcast #190. This is one episode in an arc relating to the late Carl Sagan's Cosmos series. The Space Sciences Lab at UC Berkeley (which is where SETI@home resides) recently celebrated its 50 anniversary. Here's a fun slideshow/article in Network World about BOINC and various other BOINC projects. An article in The Star[/url] (New Zealand) tells how a 14-year-old arranged to run SETI@home on 90 computers at his school. on 90 computers at his school. We are proud to announce the very first publicly available output of the Near-Time Persistency Checker (a process which ranks the statistical interest of points on the sky). Please read the Frequency Asked Questions first. The SETI@Netherlands team is hosting a 10th anniversary Gauntlet. If you think your machines have the power to compete, signups end September 18th. We updated the master seti.berkeley.edu page, which contains information/links about all of U.C. Berkeley's SETI-related projects, as well as general weekly meeting minutes! given during the SETI@home 10 Year Anniversary celebration in May. The Institution of Engineering and Technology has posted an article about volunteer computing in astronomy. We updated the SERENDIP web site, now containing information about our recent trip to Arecibo (to install the new instrument and do some testing). Here's a video of Dan Werthimer giving a short talk about SETI@home at the Maker Faire Bay Area (on May 30th, 2009). Warning: must sit through ad before viewing. Dan Werthimer was on Science Friday discussing SETI@home's 10 year anniversary. Here is a recording of the interview. A new update from the Planetary Society: SERENDIP Takes a Great Leap Forward. You can tune in to video from tomorrow's SETI@home Anniversary seminar live on ustream.tv starting at 10am pacific time (1700 UTC). If you can't watch it live, don't worry. We will be posting the video for download later. SETI@home 10th Anniversary T-shirts are now available for order. See this thread for details. Thanks to Uli for handling the T-shirt manufacturing and shipping, and thanks to Misfit for the winning design. If you're planning to attend the SETI@home 10th anniversary picnic in Berkeley on May 23, please RSVP if you haven't done so already. You can RSVP in this thread, send a personal message to Uli or email korpela -AT- ssl.berkeley.edu . 10th anniversary on 17 May 2009.
will be held on 21 May. and can view the proceedings online. A new portal for astronomy related newsfeeds and blogs called Portal to the Universe has opened. pictures of a trip to Arecibo. Contratulations to team SETI.USA, which has recently passed the 1,000,000,000 credit mark on SETI@home and continues to pile up credits at over 1 million per day! One of our volunteers, Blurf, has started a SETI@Home Tax Time Donation Challenge! SETI@home Chief Scientist Dan Werthimer gave a International Year of Astronomy talk in Berkeley on March 21st. A video of the talk is available here. We are currently managing several problems with the science database server. The database will be okay, but it is currently offline. It was take a while before we are fully back up and running normally. In the meantime we will mostly be unable to create new workunits, so expect your clients to run idle for the next few days (unless you are running other BOINC projects!). for the International Year of Astronomy (2009). Our own Dan Werthimer will be speaking on March 21st. using their CUDA computing engine has been released. The CUDA version runs up to 10X faster than the CPU version. about the SETI@home CUDA client and about GPU Grid. See directions for getting started. (in the form of one Snap Server 18000 and two SD30 expansion units). in particle physics and cosmic rays, passed away on 9 November at age 94. (to be published in Acta Astronautica). Some of our volunteers have started a Halloween Donation Challenge. Feel free to beat the holiday rush. Assuming your bank is still in business, and you can still afford it. By the way... SETI@home just received its billionth result using BOINC - thanks to everybody who donated their computing power to help us reach this incredible milestone! The Planetary Society presents a radio interview with Dan Werthimer: "Astropulse: A New Way for E.T. to Phone Home"
New article from The Planetary Society: "Astropulse: A Fresh Look at the Skies in Search of E.T." The Foundation for Computational Learning and Science is performing a survey of BOINC users. The survey asks BOINC client users about their demographic data, level of education, income, project participation, level of interest, suggestions for improvement, and technical data related to their computers running BOINC. If you would like to participate the survey is here. Apparently people weren't satisfied with a 3 day challenge, so Blurf started a new 5 Day SETI Donation Challenge. Thank you to all who gave for Blurf's 3 Day Seti Donation Challenge! The final amounts are: $5977.65 Donated and $6500 Pledged. Some of our volunteers have started a 3 Day Donation Challenge. The upload server has been fixed. Once the system clears the backlog of results waiting to be uploaded, validated, and assimilated, disk space will clear up and this will allow new work to be generated. We've started creating work for SETI@home's new Astropulse application. At first we will just create a small amount, but we expect to enter full production next week. There is an article at Wikinews[/url] about the budget cuts that threaten the Arecibo telescope. Apple/Mac computers have been unable to get new workunits since yesterday - we're working on this bug. We have been struggling with database problems for the past few days, though we made some progress today. Various services may still be up and down throughout the weekend, but we may be beyond the worst of it. The future of Arecibo Observatory (where SETI@home collects its data) is threatened. If you are a U.S.
House resolution to continue Arecibo's funding. We swapped servers around this morning (in preparation of future upgrades) - you may be experiencing temporarily difficulty connecting to our data servers. Stopping/restarting your BOINC client may help. We are in the process of recovering from a minor science database issue. Due to the general heavy load on our systems you might find it hard to upload/download work for the next day or so. SETI@home Project Scientist Eric Korpela speaks about the probablility of finding intelligent life on earthlike planets as one of the guests interviewed by Seth Shostak on this week edition of 'Are We Alone', the SETI Institute's Weekly radio magazine. Congratulations to team SETI.USA. Their total BOINC credits have exceeded 1 billion cobblestones! The Near Time Persistency Checker (software we are developing to get up-to-date analysis of SETI@home results) has enjoyed recent progress. added counts of signals SETI@home found where the Arecibo is currently pointing. Some SETI@home volunteers put together a tribute to Arthur C. Clarke as a means of paying their final respects. We are sure he would have been touched by your sentiments. Last night the BOINC database server crashed - all services are recovering now. Arthur C. Clarke, visionary science fiction writer and friend of the SETI@home Project, passed away today at the age of 90.
the top-ranked team in the University category for several years. We have been informed of the passing of a dedicated SETI@home volunteer and active participant on the forums, Dennis Peters, (aka Dogbytes). Our condolences go out to his family and friends. From SETI@home to Hominid Fossils: Citizen Cyberscience Reshapes Research Landscape. UC Berkeley Press Release: SETI@home looking for more volunteers. back on this morning, and all data servers are slowly catching up. was mistakenly initialized to 'on'. We have changed it to 'off' for all users. (article from the the Planetary Society). has resulted in the project running out of work to send. We hope to see it clear by tomorrow morning. 1974 radio transmission from Arecibo. We are having air conditioning problems. The project is down for the night. In order to quickly recover from the fallout of recent server outages, we'll be offline all night to clean up the database. Data transactions will resume Tuesday afternoon. Upload service is back to normal. Details are in technical news. dramatically. The slowdown was unexpected and we are in the process of fixing it.[/url]. We had three server crashes over the weekend and are recovering now. Details later today in technical news. We note the passing of dedicated SETI@home volunteer John McCoy. Our thoughts and sympathies go out to his friends and family. currently creating and sending out new work. The problematic server is back up and work is flowing. Were're having problems with one our servers. We'll be down until someone can get into the lab to fix it. systems are having problems. We're probably going to be offline all night. All data services will be off until we clean all these things up. Our Internet connectivity was restored at 01:00 PDT today. All of our servers came up fine after the power outage. However we are currently experiencing a routing problem that we are working with campus on. This problem is preventing the distribution of work. At this point it looks like we will be off the air until tomorrow. If you are having problems with the MacOS version of SETI@home (5.21) please reset the project to get version 5.22. There will be a lab-wide power outage (for repairs in a nearby building) this weekend. We'll be shutting down BOINC/SETI@home services around 16:00 PDT on Saturday, and coming back on line 08:00 PDT on Sunday. All web/data servers will be unreachable during this time. A mysterious source of radio interference has been identified and fixed - read about it here. Here's a SETI@home Update (article written by the Planetary Society). SETI, distributed computing, and space exploration in an interview by Mike of BOINC UK. publicize SETI@home and BOINC by writing to computer magazines. We have an update on the Arecibo Painting Upgrade. We're having a brief server outage to reconfigure our databases. We should be back up in an hour or so. Read about how to participate in grid computing projects that benefit humanity. up some problems we've been having with the BOINC database over the weekend. The data servers and most web pages will be offline during this time. of "catch up" before things are back to normal. feeder problem that was causing work distribution to go slowly. We've solved yesterday's problem and we're back up. and restarting your BOINC client should fix the problem. it up. It came right up, but verifying the file systems took overnight. The work is being created, the splitters and assimilators are working. Our science database server died on Tuesday, May 1st. again. Details on the server crash and our recovery from it can be found in Technical News. Happy May Day. Unfortunately for us it's been "Mayday! Mayday!" At 4:43 (PDT) this morning, our science database machine, thumper, became hasenfeffer. It currently refuses to acknowledge that it has any disk drives. Since the controllers are attached to the motherboard, major repairs will probably be required. No work can be created until this machine gets fixed. We are on the phone with Sun now in hopes of securing repair or a replacement. More info in Technical News. what we have seen during our observations of this red dwarf star. can see at Arecibo Observatory, so we actually made no such observations. term, there may be periods when it is difficult to obtain work. and will eventually get data to process. for a couple of days..
transfers, etc.) may by off-line for short periods. to cast your vote for them at the SXSW website. We're currently in the middle of network/database testing. Connections to our web and data servers may be intermittent. and rebuild the affected tables(s) tomorrow. by talking with them using Skype. even if you lost your Classic password. a system tray application for Linux. division, edging out QMC at home. and the possibilities of finding ET. Download the MP3 file (11.8 MB). We had a couple minor server issues over the weekend. by Mike O'Connell of BOINC UK. or a mirror at Berkeley. (from UC Berkeley Space Sciences Lab). start creating new work to send out later today. thanks to the efforts of BOINC UK. We ran out of work to send out due to our science database going down. More details in Technical News. submitted by a user (and send us your own). and other BOINC projects, recently moved into beta test. It was written up by CNET. SETI@home T-shirts and mugs with their team logo added. send email to your friends and family. 'Which are the most important factors when you decide whether to participate in a BOINC project?' were not recorded correctly. Please fill out the survey form again. Please fill out the BOINC user survey. Your responses will help us improve SETI@home. while we run checks on the tables. electrical problems in a nearby facility. More detail available in Technical News. There will be a brief outage today at 17:00 UTC for database maintenance. We estimate the data servers and web pages will be offline for 2 hours, after which the usual "catch up" period will follow. The SETI@home store is now open. all with SETI@home logos and graphics. Part of the proceeds go to support SETI@home. At 13:30 UTC yesterday the SETI@home upload/download server failed. We've solved the problem, so you should be able to upload results and download new work at this time. There will probably be a long period where the servers are overloaded with backlogged requests. Thank you for your patience. associated with SETI@home and volunteer computing. All of our splitters have been altered to create workunits for SETI@home enhanced. Thanks for your patience during this transition. A cascade of problems today caused inability to return results and later, the inability to download new work. One of the data servers lost the ability to see the upload directory. After reboot, it temporarily lost the ability to see the entire network. has recently opened; check it out. The first SETI@home fundraising drive has drawn to a close. Thanks to your help, we've raised over $250,000 for continued operations, about one-third of our total goal. Because of this we've been able to complete and release our SETI@home Enhanced application. In addition, in June we will be going to Arecibo to install the new Multi-beam data recorder. If you haven't yet donated, please do. spotty for a while. This will correct itself. 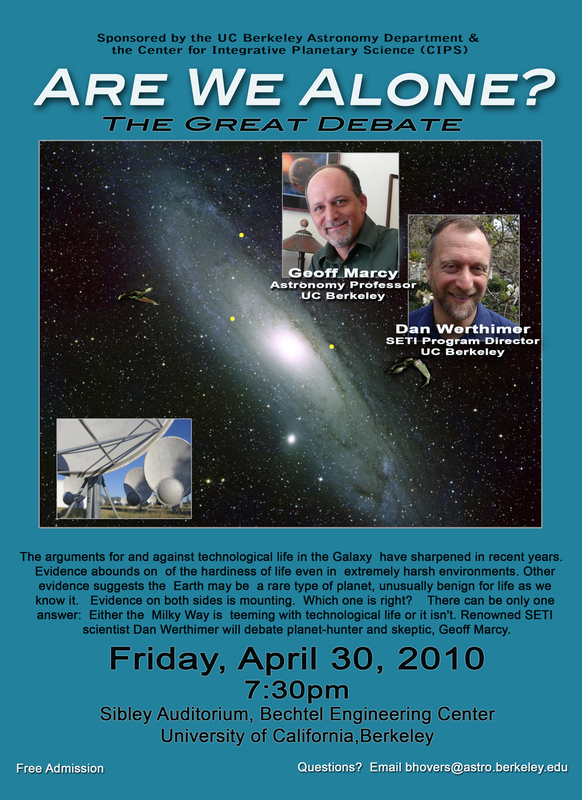 talk about SETI and SETI@Home today on the UC Berkeley campus at 1pm. You're invited to join him in Room 120 Latimer Hall on campus. Our regular Wednesday maintenance outage has been moved to Tuesdays beginning this week. We're doing this to accomodate a number of scheduling conflicts that prevented all of the engineers from being available during the outages. of SETI@home and other BOINC projects. to the about SETI@home page. are (as of yesterday evening) sending out new work. of thoroughly checking the data. is the first German Podcast about BOINC. and will present and explain the projects that use BOINC. (BBC-4, February 20th, for UK BOINCers). BOINC lets you mix in other scientific computing with SETI@home. a new project from the Technical University of Munich. to many bioinformatics research projects. to find all the generalized binary number systems. problems again. If so, this will likely be fixed tomorrow. be intermittent problems contacting the scheduling server. we fixed a bug in the script. copied to SETI@home/BOINC, and are shown on User Pages. intermittent as we return to normal. More about it in Technical News. Yesterday we stopped accepting results for SETI@home Classic. The Classic project stats are now frozen. 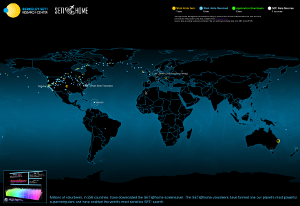 about SETI@home's transition to BOINC appears in the Nature web site. SETI@home Classic sent out its last workunit. SETI@home project in the coming weeks. tremendous dedication to the project. You made SETI@home into something of lasting significance. Read a brief history of SETI@home. most are getting through at this time. lost credit. More in Technical News. please download new client software (5.2.12) and try again. We have fixed some problems involving personal Internet Firewalls. without setting a password first. and are working to resolve them. that BOINC is not blocked by a personal firewall. in the next BOINC release). Questions and Answers area for help. clearing up now. More info in Technical News. is on sale for $34.95! Get one before they're gone. will stop issuing work on December 15, 2005. 'Getting started' on this page). Progress will be detailed in Technical News. and to design new chemical catalysts and potential HIV vaccines. been acknowledged in a scientific paper describing the results. Version 5.2 of the BOINC client software has been released. using email address and password, instead of account key. Our upload/download server is no longer dropping connections. We had the validators off overnight to hasten the recovery. They are now back on. decreasing and should reach zero by the end of the day (PDT). and active community member, passed away recently. We honor him as User of the Day. is returning to television on The Science Channel. with subsequent episodes airing every Tuesday night at 9 PM. to make it look right. on this web site (unless you choose to remain anonymous). of data is taking longer than expected. Uploads and downloads will be unavailable at this time. This should vastly improve our general system performance. More information in Technical News. Congratulations to everyone for this achievement. causing users to get 'Invalid or missing account key' messages. These accounts have now been restored. of connections as we recover from a week-long outage. your email address and a password of your choice. a faulty router. The web site and the scheduler will be off the air. to test the deletion of old result files. See Technical News. folks are working on a fix. may be clogged as the backlog of work clears. will remain off until the initial demand dies down. at 02:00 UTC, because of major electrical work being done at the lab. can be read about in detail in Technical News. old one. Details will be appearing in Technical News. This should help clear the backlog of result uploads. we hope to have it online in the next day or so. this long after an outage. We are working to figure out why. We safely restarted the project after an all-night (planned) power outage. The file upload handler crashed last night, but is back up and running now. BOINC statistics sites continue to evolve. Update: Today's outage is postponed with the date TBD. last more than an hour. and Mac OS X. Graphics are now available for Mac OS X. The Windows release fixes an ATI graphics bug. be used to better track client errors. The outage will begin at 17:30 UTC and may last up to 2 hours. we are, and always have been, behind a hardware firewall that works great. drops until the backlog is cleared. Professor Morrison pioneered the concept of interstellar communication in 1959, creating the field of SETI. Phil will be deeply missed by the Berkeley SETI team. with work around proxy information here. others on the messages boards for contributing information. we learn more. Many thanks go to the posters in this message board thread for their diagnostics and work arounds. including Solaris/x86-64, Linux/x86-64, Linux/PPC, HP-UX, and FreeBSD. without changing your browser's language preference. it did not solve the graphics problem. We have released version 4.10 of the SETI@home application for Windows. This release fixes a bug that caused graphics not to display. that shows your Classic work, BOINC work, or both. buy an Official SETI@home Certificate Frame. recent outages can be found in Technical News. servers may be bogged down as they try to make up for lost time. We'll post more information once we're told what happened. are linked to the proper SETI@home/BOINC account. This is a bit complicated because of email address changes. See our current transition plan. merging accounts with conflicting email addresses. with current information from SETI@home Classic. Star Trek is going off the air! here how Star Trek Helped Launch SETI@home. a power outage is in place. Around 18:00 UTC we had another unexpected lab-wide power outage. The database has been restored and all services are back up. and download problems until the load normalizes. More info in Technical News. through tomorrow morning. More info in Technical News. the SETI@home web site into non-English languages. If you're interested, learn more. For data server updates, see Technical News. project was officially launched this morning. using data from the LIGO and GEO gravitational wave detectors. be going up and down as we work on this. See Technical News. Update. Yet another data server array hang. The vendor is looking into it. back one at a time while we monitor the data server storage array. migration. The project will remain off through all of this. The data server failed around 20:30 UTC for the third time in as many days. The project will be down as we continue to diagnose the problem. was not on that machine). We have moved the primary database service over to the the new system. The initial migration of the database to the new server is complete. goes well it will become the database primary in a few days. work fast enough because of competition for database access. The DB migration stopped when the new server crashed. size of the DB and so the migration will go faster. XML stats generation for the time being. design based on the new SETI@home logo. until we diagnose a recent DB slowdown. and use a quorum size of 3 for validation. will not delay reaching a quorum. that were completed more than 7 days ago. We are experimenting with redundancy parameters. when 2 (rather than 3) of them are returned. This should result in faster validation. while make some changes to the database structure. [ Good news - changes are all done, and it only took 2 hours ]. courtesy of Jochen van Waasen. Windows application version 4.08 is released. It should fix the graphics preferences problem. SETI@home application version 4.07 is released. This build should increase speed over the previous version. The disk array has resynced and the scheduler is back on. There was a two hour outage this morning for hardware upgrades. Read more about it in Technical News. SETI@home and BOINC are featured on Catalan TV news. (RealVideo) or the English transcript. Each team now has a Create team account URL. and will have the project preferences of its founder. Team founders: put this URL on your team's web page. and everything is back to normal. by other users (and therefore cannot be validated yet). weren't being understood correctly by the client. crash. Everything is back up now. of the new replica database. We added some new message-board features. A problem with file uploads has existed for the last few days. This problem causes file uploads to fail. it will probably require upgrading your BOINC client. This should be complete in the early evening hours (Pacific Time). We think it is fixed now. Our apologies if you lost work because of this. failed yesterday and needed to be rebooted and resync'ed. now it is back up and running. progress bar advances in a more linear fashion. checksum errors and failed to run. This has been fixed in 4.05. Learn how to customize SETI@home graphics. preventing you from getting through right away. file deleter and validator back on. assimilator need to be off. The scheduler is back on. We are still investigating the transitioner lag. has been broken since July 22; it's fixed now. produced a truncated page. This is now fixed. to this release as soon as possible. a web page showing server status. or optimize it for specific architectures. boinc_opt@ssl.berkeley.edu, for people interested in this. We have added a number of new features to the message boards. Thanks to Janus Kristensen for contributing this. Stats are now available on your cell phone. See 'Your Account' for the URL. This feature was developed by Carl Christensen of CPDN. The snap server continues to run well. should no longer be occurring. taking us longer than expected. only use the 18000 head unit for now, keeping no data on the sd30 expansion. start final move. With luck we will have the project up by EOD tomorrow. The Snap App hung again. We will be down for the night. support and all seems fine at this point. Snap Applicance work around on the 18000.
yet implemented). It has not yet responded to a reboot command. Please check it out for any updates. on Win98 and WinME until this issue is resolved. another BOINC-based project, is now open. even when SETI@home has no work available. to divide CPU time between projects. Snap App folks for working very hard on this problem. was causing it to bomb after a number of connections. now and the scheduler seems to be working OK at this point. we are back up with the major version upgrade to 4.x. getting a new supply of work. Everyone will need to download a new core client. and results to send out after the migration when the clients reset themselves. morning. We'll post the revised schedule as soon as plans have been firmed up. remaining results to report should get them in before the upgrade. three splitters will be up and running producing work as quickly as possible. A trio of splitters are now up and producing new work. be credited. This work is being regenerated and redistributed. for all those backlogged results. there will be work to send out to the clients. between August 13th and 18th were lost as well. a few days ago. This process will continue through tomorrow. corruption. The project will remain down until we recover the database. time being, but may have to stop if problems arise. The DB is now on the Snap Appliance and the web site is back up. download directories is still under way. upload directory to the Snap Appliance, along with the DB. to the Snap Appliance and turn on the hierarchical directory structure. problem. This may take a day or so. in alpha now. Next week it will go to beta and then to public. are awaiting a UPS for it. BOINC software. This message was in error - please remain with version 3.
results back into play somehow. the DB files. We will post the progress as we go. difficulty in transferring work and loading certain web pages. We're tuning these servers and trying to find the bottlenecks now. The project remained down all weekend, but we are back up now. to the rest of the world for a few hours this morning. project up while others remain down for repair. each affected result as unsent so that it will be resent. decided to launch a denial of service attack yesterday afternoon. overnight to let the transitioner work through it's backlog. way in preventing a large backlog from recurring. and try and let the transitioners pick up the pace a bit. project should return to normal. had only processed 6 million through the whole life of that project to date. and they are back to creating new workunits. new results from being created in response to failed results. the 2 successful results would not be validated or credited. all workunits in this state. Our database server hung and had to be forcibly terminated. It took several hours to check all the tables and indices. for the first time in 18 months. Additional outages may occur throughout the night and possibly tomorrow. are now keeping up with demand. have to bring additional splitters online to keep up with demand. server and then will self correct by contacting the master URL. The project will be shut down for several hours today. We made some progress and are turning the project on. You may still have problems getting work. back to SETI@home Classic for the next few days. We've been having problems with server performance. To address these problems we're making some changes to our database. The project will be shut down most of today while this is being done. The web site has been reenabled. the week which should help with the performance problems. revert back to the original SAH client. An additional transitioner has been brought online. We are turning on the web site and will be monitoring the system. We may have to shut it down again if traffic becomes too bad. We are investigating further performance enhancements. We are going to leave the project down until Monday. We are going to bring back up the scheduler in an hour. processing workunits at a much faster rate. we are waiting on replacements before bringing it online. The transitioner is not currently able to keep up with the splitters. transitioner a chance to catch up with the rest of the system. we are bringing another splitter online. We will be having a short server outage tomorrow at 17:00 UTC. The URL of this project is http://setiathome.berkeley.edu. and attach to this URL. Version 3.19 of the BOINC core client for Windows is released. Welcome to the new SETI@home! The project is now officially active. and setting all credits (user, team, host) to zero. tests for their help in debugging SETI@home and BOINC. and it's taken a while for the database to repair itself. NOTICE: this project is not officially active. We may delete results and reset credits at any time. user-related tables from the SETI@home database.